At Ormsgill, English is given a high priority and is taught daily in every class. We believe that English allows pupils to access all areas of the curriculum and so we promote the use of high standards of literacy, articulacy and the correct use of standard English in all subject areas. We aim to foster a love for Literacy through the use of exciting and engaging texts, drama, guided reading, story time, book clubs, debates and discussions, ICT, art and videos. We follow the National Curriculum guidance for English which sets out aims for speaking and listening, reading and writing. 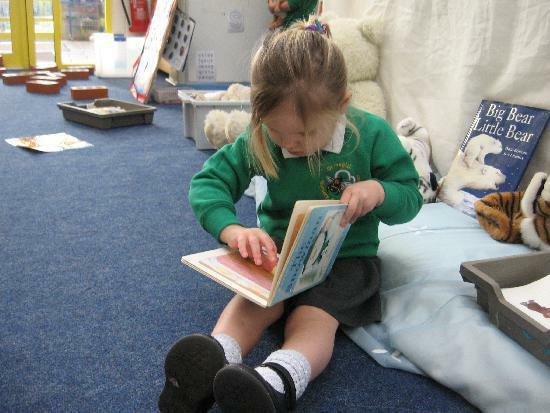 At Ormsgill, we follow a range of reading schemes to ensure our children are suitably challenged, can progress, develop understanding and ultimately enjoy reading. We predominantly use Oxford Reading Tree which complements other reading schemes used throughout school.